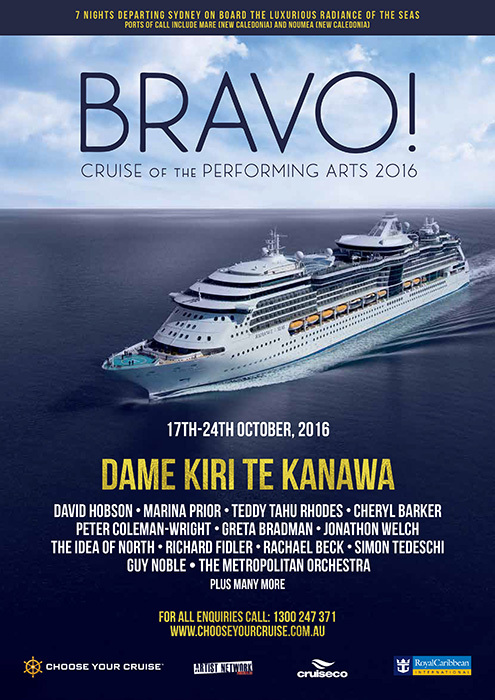 Kiri Te Kanawa was born in New Zealand with European and Maori heritage. By the time she was 20 she had won the major vocal prizes available in the South Pacific, and had also started her recording career – unusual for a prima donna in any era. In 1965 she moved to London to study at the London Opera Centre. After first appearing as Carmen in Britain and New Zealand, the young Te Kanawa was marked for Mozart’s Marriage of Figaro, first at Sante Fe then at the Royal Opera House, Covent Garden in 1971. After her sensational debut in Figaro Kiri Te Kanawa gained legendary status almost overnight and moved rapidly into the front rank of international opera. She became one of the most famous sopranos in the world, a familiar figure in the leading opera houses of the world – Covent Garden, the Metropolitan, the Chicago Lyric Opera, Paris Opera, Sydney Opera House, the Vienna State, La Scala, San Francisco, Munich and Cologne. Her heroines include the three major leading roles by Richard Strauss (Arabella, The Marschallin, and the Countess in Capriccio) ; Mozart’s Fiordiligi, Donna Elvira, Pamina and, of course, the Countess Almaviva; Verdi’s Violetta, Amelia Boccanegra, Desdemona; Puccini’s Tosca, Mimi and Manon Lescaut; Johann Strauss’ Rosalinde, and Tchaikovsky’s Tatiana, also Bizet’s Micaela (or Carmen), Gounod’s Marguerite and Barber’s Vanessa. On the concert stage, her natural serenity and vocal beauty have joined with the world’s major orchestral ensembles – Chicago Symphony, Los Angeles Philharmonic, London Symphony and the Boston Symphony under the baton of such conductors as Claudio Abbado, Sir Colin Davis, Charles Dutoit, James Levine, Zubin Mehta, Seiji Ozawa and Sir Georg Solti. She has appeared at venues as diverse as Glyndebourne, Tanglewood, Ravinia, the Verona Arena, the Hollywood Bowl, the festivals of Aix-en-Provence and Salzburg, and the desert outback of Australia. Dame Kiri’s recordings include the complete Don Giovanni, Le Nozze di Figaro, Cosí fan Tutte, Die Zauberflöte and Tosca, La Rondine and Manon Lescaut, plus Simon Boccanegra, Arabella, Otello, La Traviata, Der Rosenkavalier, Faust, Eugene Onegin, Carmen, Capriccio and La Bohème, along with selections of arias from French, Italian and German operas. Outside the operatic field, her recordings are equally extensive and include: Mozart concert arias; the Strauss Four Last Songs; and the notably successful Songs of the Auvergne (top of the best-seller charts in Britain); Berlioz’s Nuits d’été; Brahms’ German Requiem; Handel’s Messiah, and the Beethoven 9th and Mahler 4th Symphonies. She also joined Nelson Riddle for Blue Skies, an album of American popular songs; followed by albums of Gershwin, Porter and Kern songs and three classics of the light music stage: My Fair Lady, South Pacific, and Leonard Bernstein’s only recording of West Side Story. Created a Dame Commander of the British Empire in 1982, Kiri Te Kanawa has been conferred with honorary degrees from the Universities in Cambridge, Oxford, Dundee, Durham, Nottingham, Sunderland, Warwick, Auckland, Waikato, Chicago and Wellington. She is also an honorary fellow of Somerville College, Oxford, and Wolfson College, Cambridge, and was invested with the Order of Australia in 1990. In the 1995 Queen’s Birthday Honours List, she was awarded the prestigious Order of New Zealand. Kiri is an Honorary Member of the Royal Academy of Music. As a soloist at the wedding of HRH Prince Charles in St Paul’s Cathedral, she faced one of the largest direct telecast audience of any singer in history (estimated to be over 600 million people). 1990 saw another record when, during a tour of Australia and New Zealand, her outdoor concert in the city of Auckland attracted a crowd of 140,000. In 1999 Dame Kiri released a new album “Maori Songs” (EMI Label), a tribute to her background and homeland, and in 2000 performed in Gisborne, New Zealand, to welcome the first dawn of the new Millennium. Dame Kiri was the single most featured artist throughout the 2000 TODAY live global telecast – the longest ever continously live programme, broadcast to over 80 countries and an estimated audience of over one billion people. In 2004 she gave a gala concert in Auckland to launch the Kiri Te Kanawa Foundation which aims to give support and financial assistance to dedicated New Zealand singers and musicians. In 2006 she received the International Achievement Summit Award and in 2010 was presented with the British Recording Industry’s ‘Lifetime Achievement ‘ Award. In 2012 she was named ‘Iconic New Zealander of the Year’. In 2010, her final appearance in a leading operatic role was the Marchioness in Cologne Opera’s ‘Der Rosenkavalier”. During 2013 she will appear in “Downton Abbey” playing legendary Australian diva Dame Nellie Melba and commitments in 2014 include a guest appearance during the Covent Garden Opera season. Dame Kiri continues to perform in concert halls throughout the world with recent performances in China, New Zealand, USA, United Kingdom, Australia, Korea, Canada, Brazil, Sweden, Germany, Spain, the Netherlands and Norway. During 2013 she appeared in “Downton Abbey’ playing legendary Australian diva Dame Nellie Melba, and commitments in 2014 included guest appearances during the Covent Garden Opera season of ‘Daughter of the Regiment’.